So who wouldn't love a box of colorful macarons for their birthday? 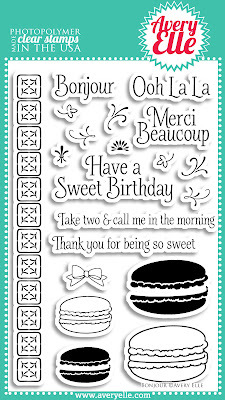 (Okay, the real thing may be a little bit better, but this is just as fun;) With the coordinating dies, this card was super, super easy and quick to do. Don't the dies cut perfectly? I absolutely love how Jamie has designed the dies with a narrower space around the stamped image. 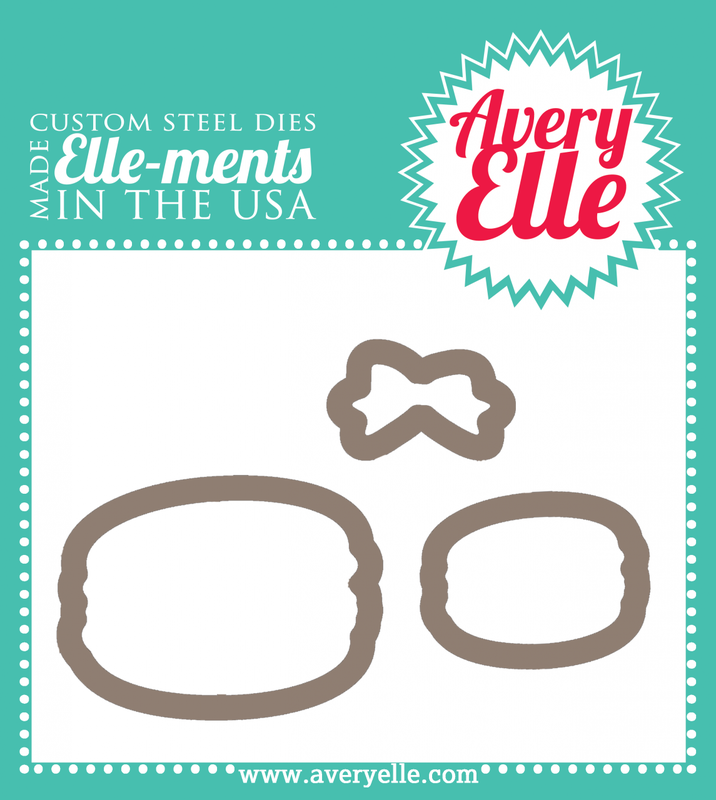 Since the die is open in the middle, it's a cinch to center perfectly over the stamped image. No more wonky die cuts, lol! For the box, I used the border stamp (embossed in gold) to dress it up a bit. The sentiment is also embossed in gold with a couple of the flourish stamps. Thanks so much for stopping in today! Hop on over to Heather's blog today too! She's highlighting the set Link It Up! Now I'm hungry. Thanks JJ. 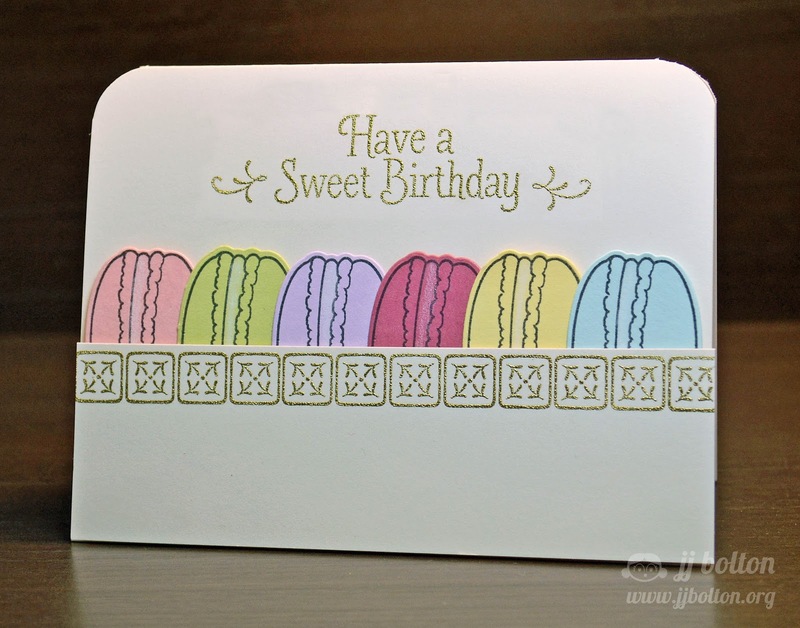 Love this card, definitely evokes the look of a macaron box, and I love all those sweet colours!! I'm hungry too! 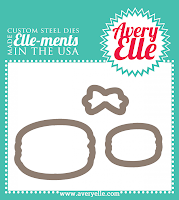 This is so cute, I love the soft colors of the cookies and the gold embossing is perfect! I feel like I am in a Parisian cafe....savoring these yummy Macarons!! Divine (the card, that is)! such a fun card.. love the gold embossing..
What a sweet card! (pun totally intended!) Love the soft colors combined with the gold embossing! oooh, these are just de-lish! Love your gold embossing too. Totally reminds me of wire bakers racks in a downtown display of yummy treats! Such a fun presentation of the macarons! Love this! Oooh I love your embossing and pocket full of cookies in their fancy box!